A leading Maine provider of women’s health care filed a federal lawsuit in Portland on Wednesday to stop looming federal prohibitions on what doctors can tell patients about reproductive health care. On behalf of Maine Family Planning, the state’s only direct recipient of Title X funds, the Center for Reproductive Rights went to federal court in Portland to seek a preliminary injunction to stop implementation of new, more restrictive changes to the federal program, which were announced late last month and are supported by Republican President Donald Trump. The $286 million federal program, established in the 1970s, has been pivotal for millions of low-income citizens in need of affordable reproductive health care. Title X facility offerings include access to birth control, testing for sexually transmitted diseases, prenatal care, abortion referrals and certain cancer screenings. The new ruling effectively institutes what opponents have called a “gag rule,” because it will block doctors and nurses at these facilities from discussing abortion as a viable option with pregnant patients, or making referrals to abortion providers. It will also force the nearly 20 Title X facilities around the state to “eliminate” on-site abortion services, leaving Maine with three publicly accessible abortion providers, Maine Family Planning President and CEO George Hill said Wednesday. The lawsuit, filed Wednesday morning, claims the Department of Health and Human Services ruling violates the U.S. Constitution by causing an “undue burden” to a woman’s right to access an abortion in Maine. It also claims the new rules violate medical professionals’ right to free speech because they’re barred from freely discussing abortion with patients, said Julie Rikelman, U.S. Litigation Director at the Center for Reproductive Rights. It’s these aspects of the new ruling that “pose an unprecedented threat to our organization, to Maine’s Title X network, and to the [more than] 23,000 patients our network services,” Hill said. Maine Family Planning’s annual operating budget is between $7.5 million and $8 million. It receives a little more than $2 million in Title X money each year, which is disbursed to its 18 owner-operated health care centers across the state. 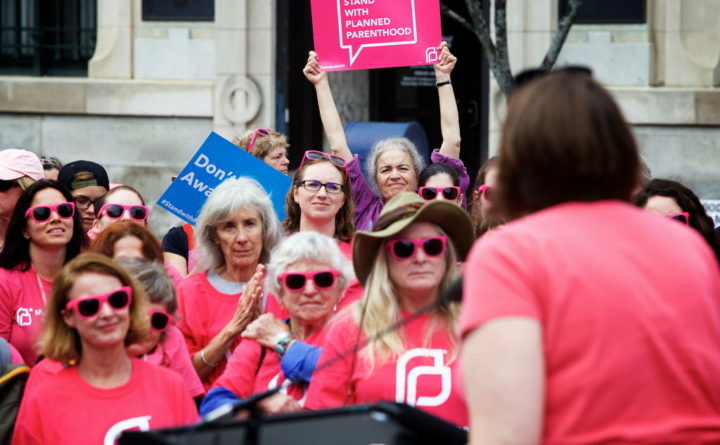 Lesser amounts are earmarked for partner groups, such as Planned Parenthood. Independent abortion services are offered in the same buildings at all Maine Family Planning locations, but no Title X money is directly used to provide abortions, Kate Brogan, the organization’s vice president of public affairs said last month. Under the new ruling, these two patient offerings will have to be unequivocally separate. If the two are not physically and financially separated, Maine Family Planning would no longer qualify for Title X funds, which Hill said, “threatens the very existence of” those clinics. Though the organization is focused on interceding with litigation, “certainly we have looked at what the consequences would be” if the decision is not overturned in the courts, “and what it would mean in terms of access to services throughout the state,” Hill said.